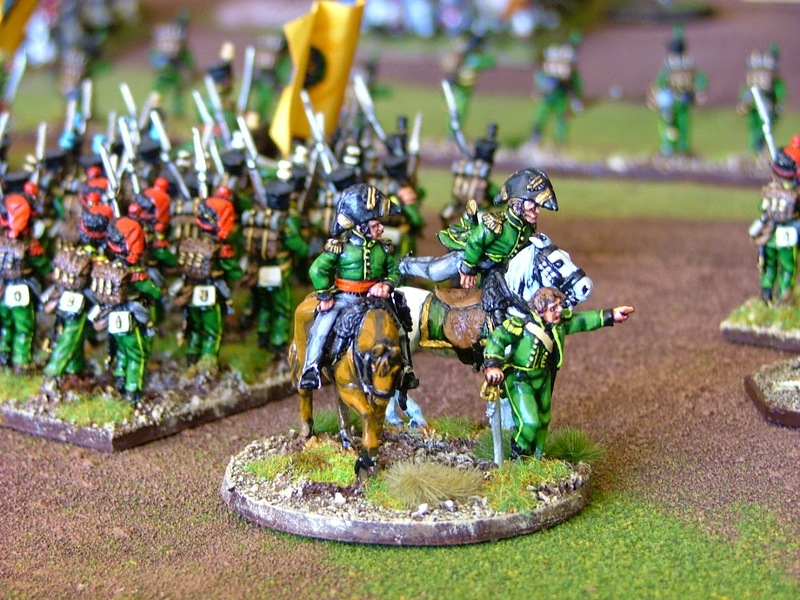 Dutch Belgian cavalry survey the field. 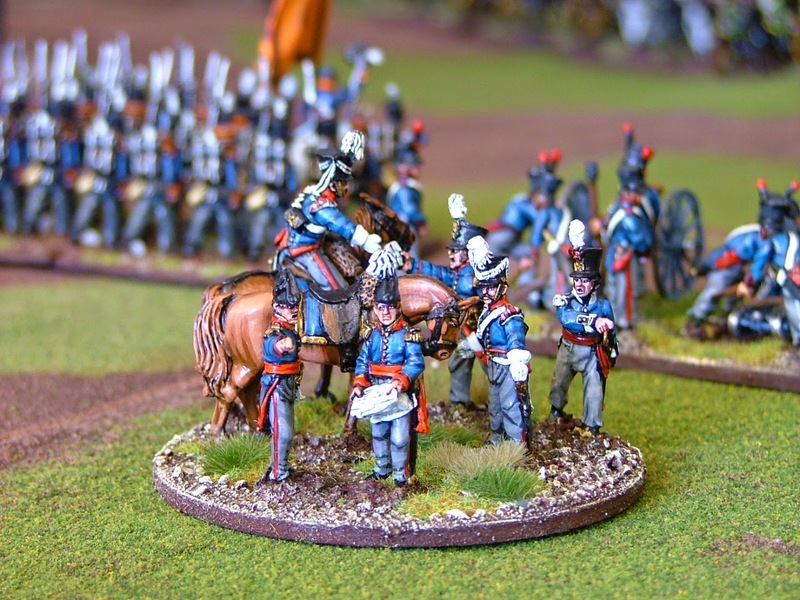 With the upcoming Waterloo Bicentenary commemorations planned at the Napoleonic Wargaming Society in a few months, I thought it was an opportune time to whet the appetite and post some pictures of my Napoleonics that are preparing to be dusted off. Here are a few shots taken of my chaps taking on Cookies French in past encounters. Is that Trip leading them or Ghigny? "Up that hill and at 'em lads!" Dutch Belgian artillery in support of the attack start to launch some withering fire. Lovely shade of blue on these lads. View from across the board - Cookie doesn't seem the least bit worried by my attack as he is chatting on the other flank!! Prince of Orange looks on. This is one of my favourite shots of him and this made it into the General De Brigade Deluxe rule set of the very clever David Brown. Saxe Weimar looks to save the day - again! Dutch Militia appear to be heading in the wrong direction. Joining the Cumberland Hussars perhaps? incredible number of beautifully painted and based figures/units, another words "bloody marvelous display of miniatures"! Thanks Phil. Collected over a few years but well worth the effort. Cheers C - though your work is what I old call sensational. That is a very impressive sight! Very well done! Thanks Rodger. Phil and Steves terrain boards are pretty impressive. Thanks Darrell - I can proudly say I painted about 10% of these figures...would still be on the first brigade if it was me alone! Very nice figures and the game shots so plenty of action (and not a label in sight). Excellent. Cheers Mark. Funny but I like your labels and those used in RFF. Might experiment with them in GdB. 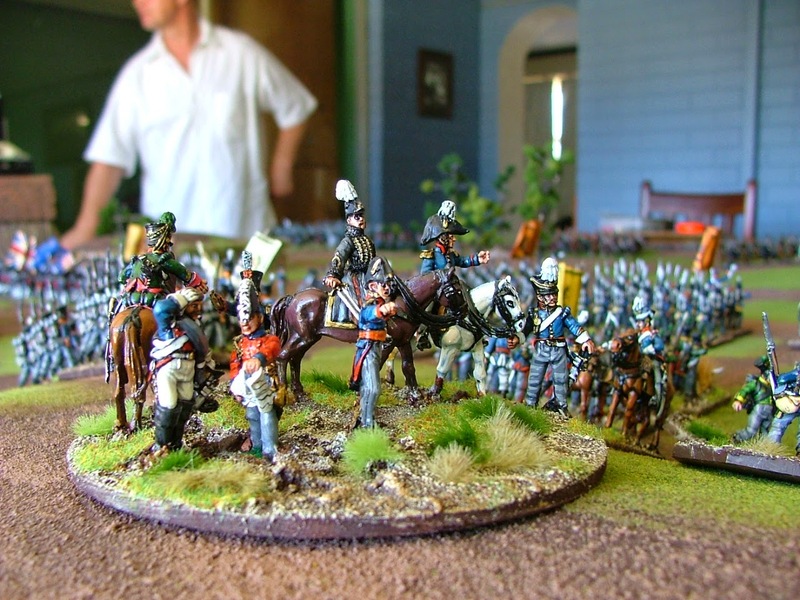 Great pictures with fantastic looking armies, command stands are most impressive! Love the command stands as well Phil. Perry do these vignettes and commanders incredibly well in my opinion and they go together very well. Stunning looking game and figures. The green uniforms are a lovely contrast to the others. Cheers Dean. The great thing about the Nassau if course is that they also bought for the French so pretty versatile units. Just love it Carlo. Gorgeous army on a smashing table. Cheers Greg - lovely fierce that played such a significant part in the hundred days but gets somewhat forgotten by wargamers. Beautiful photos Carlo. Don't often see the emphasis on the DB forces, but I am rather partial to the Nassau uniforms. Thanks for getting me even more in the mood for Waterloo than I am already. Thanks so much Chris. It was actually a built to your site which made me get my ginger out and post these. Your troops are top, top shelf mate!!! That's bloody lovely old chap! Good on you JJ - thought you might like the scale, though it us a bit smaller than your epic battles! Spectacular spread of troops, Carlo. I will probably add a unit or two of Nassauers, as they are versatile and can be used over a long period of years. The Dutch Belgians definitely have their charm, but suffer from being pretty much limited to June 1815 for (historical) actions. Joe in our group has done them for Quatre Bras, so I am (relatively) safe there! Very true mate in terms of the DB;s. As we both know however no 1815 campaign is complete without them. Thanks for the lovely comments as always mate so look forward to seeing your Nassau when they are up. I still need to do the Ussingen so watch this space. Wonderful eye candy Carlo. And yes, it is a lovely blue. Did you also then like the fortress of San Pellegino in the green glassy haze in the 8th photo down Von Peter? Hi Carlo, I really enjoy your blog, especially all,of the beautiful pictures of your figures. Thanks Duke for popping over to have a look at the blog mate. Greatly appreciated. Hope there are a few more posts coming up to take your fancy shortly. They fought well Stephen, were well lead and don't get the credit they deserve, as for the entire Dutch Belgian contingent, during this campaign. Hi Carlo, I come belated to this blog entry and I am very pleased I found it! I just love looking at your lovely collection of beautifully painted figures in what are terrific photos - super stuff! It's amazing how much similarity there is between your collection and mine both in figures, buildings and ephemera ( I note the hay stacks which I also have 3 of!) 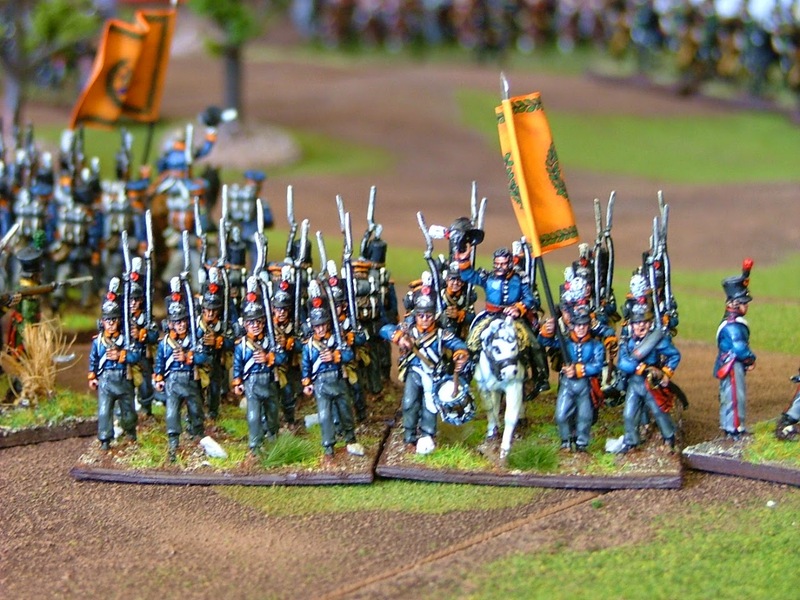 With only 6 weeks to our Quatre Bras (2nd part) refight this blog piece gives me added vigour to keep on painting and get to the end of my journey to complete my collection for the game ahead. Fantastic stuff as usual Carlo. Hopefully, Chris and I will be able to reciprocate shortly! All the best. Thank you very much Kevin for your very kind words and support for the blog. It is always so greatly appreciated. I am very much looking forward to yours and Chris’s Quatre Bras refight as I would imagine it will certainly be a wonderful sight to see if your past games are anything to go by. Look forward to seeing those wonderful figures of yours on the table and on the blog very soon.